A campaigner in the West Bank puts up a poster in support of a campaign during Ramadan encouraging people to boycott Israeli products. 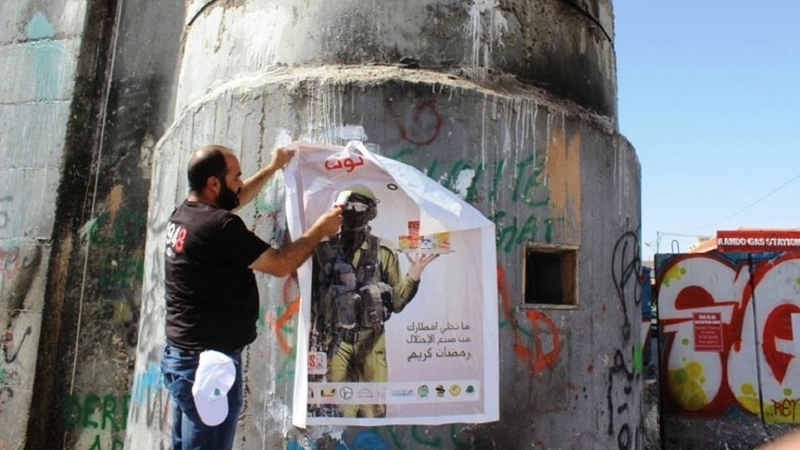 Community boycott campaigns are spreading across the West Bank and the whole of Palestine. The year 2016 will be remembered by Palestinians and supporters of Palestinian freedom, justice and equality, among other things, as Israel’s year of waging an all-out war on the Palestinian-led, global BDS movement for Palestinian rights, in a desperate attempt to crush it. In this respect, 2016 will also be remembered as the year of Israel’s spectacular failure, as BDS grew further into the mainstream, and its impact on Israel’s regime of occupation, settler-colonialism and apartheid intensified. In 2016, Israel deployed massive financial assets, intensive espionage, well-oiled propaganda, cyber “sabotage,” and, most importantly, legal warfare against BDS human rights defenders and networks. Frustrated with the spread of BDS throughout the west, in Latin America, the Arab world, South Africa and parts of Asia, Israel has hoped to leverage its enormous influence on the US Congress and state legislatures, as well as on the governments of France, the UK, Canada, among others to suppress BDS. Israel has attempted to stigmatize, demonize and in some cases delegitimize BDS from above, after failing to crush the movement at the global grassroots and civil society levels. Throughout this year, BDS has grown stronger and stronger. Major multinationals, including Orange and CRH, abandoned their involvement in Israeli projects that infringe on Palestinian rights. This followed Veolia’s exit from Israel in 2015 after losing billions of dollars worth of tenders due to seven years of BDS campaigning. Also this year, tens of city councils, mainly in Spain, announced themselves “Israeli Apartheid Free Zones,” and major churches in the US divested from Israeli banks or international companies that support the occupation. BDS has also strengthened principled intersectional coalitions with movements for racial, economic, gender and climate justice, among others, around the world. One exceptionally noteworthy achievement for the BDS movement in 2016 was its success in winning support for the right to boycott Israel in support of Palestinian rights under international law from the European Union, the governments of Sweden, Netherlands and Ireland, as well as from Amnesty International, the American Civil Liberties Union, the International Federation of Human Rights, and hundreds of political parties, trade unions and social movements across the world. The logic of appeasing Israel’s regime of oppression has started giving way to the logic of sustained international pressure, which proved instrumental in ending apartheid in South Africa. The UN Human Rights Council, for instance, adopted in its March meeting a decision to create a database of Israeli and international corporations that are complicit in and profiting from Israel’s occupation regime. This remarkable development has made many companies nervous about their own involvement in Israel’s serious violations of international law. The following timeline sums up some of the most significant indicators of direct and indirect BDS impact in various fields. Orange drops Israel affiliate following intense BDS campaigning in Egypt and France. The United Methodist Church divests from Israeli banks financing the occupation. Hundreds of academics in Brazil and Italy join the academic boycott of Israel. Irish corporation CRH becomes latest multinational to exit Israel. BDS reaches the Oscars, calling on nominees to forgo Israeli propaganda trip. Security company G4S loses major contract in Colombia. In Spain, Cordoba province declares itself Israeli Apartheid Free Zone and approves cooperation with the BDS movement. The Palestinian Human Rights Organizations Council (PHROC) defends the right to BDS against Israel as protected under international law. Sweden becomes the first European state to recognize the right to BDS against Israel. Palestinian women organizations, centers and groups call upon all women and feminists of the world, as well as women’s organizations and collectives, to endorse the BDS Call. UNICEF in Jordan ends contract with G4S. University College London Union votes to support BDS. G4S announces plans to exit the Israeli market, but BDS campaign against it continues. Dozens of Columbia University (New York) faculty call for divestment from Israel’s system of subjugation. Amnesty International supports the right of Palestinian human rights defenders engaged in BDS, condemning Israel’s threats of physical harm and deprivation of basic rights against them. Brazilian province Bahia cancels cooperation agreement with Israel’s apartheid water company Mekorot. University of Chile’s Law Faculty students vote overwhelmingly for BDS. Alliance of Baptists (US) divests from companies profiting from Israel’s occupation. UNOPS becomes 3rd UN agency in Jordan to drop G4S. Dutch parties D66 and Green Left call for sanctions against Israel. University of Chicago undergraduate student government votes decisively in favor of divestment from companies profiting from Israel’s human rights violations. Sporting giant Reebok cancels sneaker celebrating Israel’s “independence”. The governments of Netherlands and Ireland defend the right to boycott Israel under freedom of speech and freedom of association. Ontario (Canada) parliament rejects anti-BDS law. Israeli Apartheid Week (2016) was the biggest yet, with groups in over 225 cities and university campuses registering their participation. The growth of Israeli Apartheid Week in countries in Latin America and across the Arab world is particularly inspiring. Moroccan BDS campaign convinces dozens of shop owners to boycott Israeli Dates. UK largest trade unions urge G4S to stop profiting from Israel’s occupation. Human Rights Secretariat of the Uruguayan Federation of Workers of Services and Commerce calls for the boycott of Israeli products and for companies in Uruguay to break their ties with Israel’s apartheid. New York University graduate students union, part of United Auto Workers Local 2110, votes by a large margin to join BDS. The Teaching Assistants’ Association (TAA/AFT Local 3220) at the University of Wisconsin-Madison, the oldest graduate student labor union in the United States, votes overwhelmingly for divestment from Israeli state institutions and international corporations complicit in violations of Palestinian rights. The Listowel Writers’ Week Festival in Ireland rejects funding from the Israeli Embassy in Dublin. The student union at a Canadian university in Halifax votes to sell its investments in companies supporting Israel’s human rights violations, including Toyota, Caterpillar, Teva Pharmaceuticals and General Mills. Kuwait’s Public Institution for Social Security (PIFSS) divests from G4S. The International Federation of Human Rights (FIDH) supports the right to BDS. 356 European human rights organisations, church groups, trade unions and political parties call on the EU to support their right to boycott. Large coalition of civil rights, human rights and Palestine solidarity groups in the US, including the American Civil Liberties Union (ACLU), upholds the right to BDS as a form of constitutionally protected free speech. The municipal council of Bondy, near Paris, overwhelmingly adopts a boycott of Israeli colonies’ products. South Africa’s Centre for the Study of Violence and Reconciliation withdraws from genocide studies conference in Israel. The Socialist International, a massive coalition of Socialist parties in more than 100 countries, recognizes BDS as an effective strategy for fighting the Israeli occupation and the denial of Palestinian rights. Pharrell Williams, a ten-time Grammy Award winner, cancels Tel Aviv concert without explanation. The United Congregational Church of Southern Africa (UCCSA) adopts BDS. Thousands of Arab academics and intellectuals in the Gulf region condemn normalization with Israel’s regime of oppression and endorse the academic and cultural boycott against it. The Presbyterian Church USA assembly votes to study the BDS Call and engage with its authors, calling on the US government to reconsider military aid to Israel. Tens of Members of the European Parliament call on the EU to protect the right to advocate for Palestinian rights through BDS campaigning. Los Angeles Times editorial defends the right to boycott as a protected form of free speech. The Unitarian Universalist General Assembly endorsed divestment from companies complicit in Israeli apartheid. Activists, supported by leading civil rights groups, defeat anti-BDS legislation in the Massachusetts state senate. US National Labor Relations Board upholds the right of the United Electrical (UE) workers union to support BDS. Canada’s Green Party supports the right to BDS and adopts BDS measures against Israel’s occupation. The Movement for Black Lives in the US adopts BDS measures against Israel’s occupation and apartheid regime. The government of Portugal withdraws from a controversial police-training project with Israeli police. BDS leaves a mark at the Rio Olympics. UK composer Brian Eno refuses to license his music to any group sponsored by the Israeli state. EU High Representative, Federica Mogherini, affirms the right to BDS after intense grassroots and MEPs pressure. According to Israeli media reports, Beyoncé cancels Tel Aviv gigs, without connecting the decision to Palestinian appeals. The French General Confederation of Labour ‐ National Institute for Agricultural Research (CGT‐INRA) adopts BDS, despite state repression against the movement. The town council of Ivry-sur-Seine, a Paris suburb, votes by a large majority to call on the French government to end its criminalization of BDS and Palestine solidarity activism and to ban all imports of Israeli settlement goods. Derry City and Strabane District Council becomes the first local authority in Northern Ireland to pass a motion boycotting Israeli goods. Portland State University student senate votes (22 to 2) in favour of divestment in support of Palestinian human rights. A global week of action supporting a boycott of HP over its involvement in Israeli human rights violations is launched, with 100 planned activities in 100 cities across six continents. World-renowned chef Kamilla Seidler of Gustu restaurant in Bolivia withdraws from the Round Tables culinary propaganda event in Tel Aviv. Students at Norwegian University of Science and Technology adopt a resolution against a possible collaboration between NTNU and Israeli universities on oil and gas research. University of Qatar Students’ Union overwhelmingly adopts BDS Call. Elected representatives in Trondheim, Norway’s third-largest city, vote to boycott goods and services from Israel’s settlements in the occupied West Bank. US Department of State indirectly recognizes the right to boycott Israel as a matter of free speech. G4S, the world’s largest private security company, ends most of its involvement in illegal Israeli business, but BDS campaign against it to continue until the company ends all complicity in Israel’s human rights violations. Also this month, UNICEF in Lebanon and the UN World Food Program in Jordan drop their respective contracts with G4S. 200 European legal scholars issue a statement defending the right to support BDS for Palestinian Rights, dealing a significant blow to Israel’s legal warfare on BDS. The Japan External Trade Organization (JETRO) withdraws from an Israeli propaganda event in Osaka involving illegal settlements’ wineries. The city council of Valencia (Spain) votes unanimously to declare the city “Free of Israeli Apartheid,” joining dozens of other city councils across Spain. The municipal councils of Clermond-Ferrand and St. Pierre des Corps (France) vote to boycott products of Israeli colonies in the occupied Palestinian territory, joining the Paris-region councils of Bondy and Ivry-sur-Seine. The city council of Tromso (Norway) endorses a boycott of Israeli goods and services produces in the occupied Palestinian and Syrian territory, joining the city council of Trondheim. The University of Manchester (UK) student senate votes overwhelmingly for endorsing BDS against Israel. The Peace United Church of Christ in Santa Cruz votes to boycott all Hewlett Packard (HP) products because of the company’s role in Israel’s violations of Palestinian rights. The Dutch government rejects Israel lobby calls to cease funding of organizations that advocate BDS against Israel, insisting that BDS advocacy is constitutionally protected under freedom of speech and freedom of assembly. The Netherlands was among the first governments in Europe to uphold the right to BDS against Israel. The Green Party of Canada calls for “economic measures such as government sanctions, consumer boycotts, institutional divestment, economic sanctions and arms embargoes” to nonviolently pressure Israel to end its occupation, afford its Palestinian citizens equal rights, and respect the UN-stipulated right of return for Palestinian refugees. The City of Portland (Oregon) becomes the first in the US to endorse divesting from Caterpillar, among other corporations that violate socially responsible investment guidelines. Palestinian rights group, Occupation-Free Portland, is part of the coalition that campaigned for this divestment.